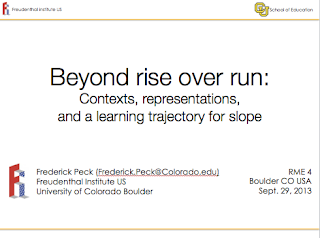 RME 4: Beyond rise over run: Contexts, representations, and a learning trajectory for slope. I was excited to facilitate this workshop at RME 4 in Boulder on September 29, 2013. Even thought the title, abstract, and slide design is very similar to the ICME talk, a lot has changed in my thinking around our study of slope in 2012. In this workshop we looked deeply at a couple of tasks and explored how the context and representations used in the tasks mediated the reinvention process. Below the abstract, there are links to the complete unit in editable form for teachers and others to use. Please download, modify, and use the tasks with your students! Despite its foundational nature in secondary and post-secondary mathematics, student understanding of slope is often formulaic and underdeveloped. To explore how students learn slope in a more robust way, we designed a curriculum for slope in which students mathematize situations involving rates of change. We designed the curriculum using RME principles, and tested and refined it in a design experiment. In this workshop, participants will engage in activities from the curriculum and I will discuss our design process. 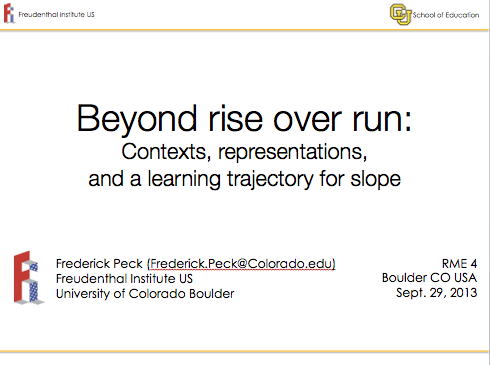 I will also discuss key findings, including how contexts and representations mediated student learning of slope.